This large 90m Metal Hose Cart (without hose) is extra tall to make towing easy, extra wide for stability and has been designed so the hose is easy to rewind. 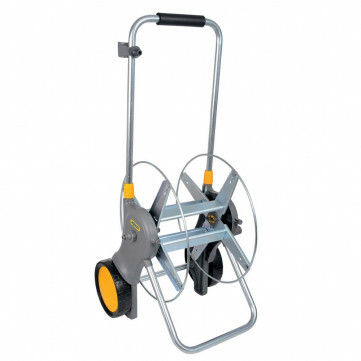 The carts meet and exceed the needs of gardeners with large gardens. Gardeners who want the easiest and simplest solution for moving and using hoses up to 90m in length. The range has been developed by gardeners for gardeners, and we have crafted the products to meet gardeners very demanding needs. Tough and Durable: Made from the highest quality zinc plated steel the new carts will handle the challenges of a big hard working garden time after time and ensure they stay rust proof. The carts comes with a three year warranty, and like all Hozelock products, a full range of spares are available to extend the life way beyond this. Easy Rewind: Rewinding the hose back in when it is full of water can be hard work so we have engineered these carts to be very easy to rewind. With a small internal drum diameter and an extra long winding handle, rewinding couldn't be easier. You will love them from the moment you start to use them. Easy to Use: Assembled and ready to use, these new large carts are packed with features. Easy to Move: The new carts have extra long (soft touch) towing handles, oversized soft patterned wheels and steel axle, which makes moving the carts a breeze. Stable: Carts falling over during rewind is the number one frustration for our gardeners, which is why weve developed these carts to have a wider stance, and combined it with a lower centre of gravity to make the new carts more stable. When the carts are up-right the wheels are slightly elevated off the floor to stop the cart following you down the garden as you unwind the hose. Easy to Store: The towing handle collars mean you can adjust the height to suit your needs and also allows you to fully retract to store in a shed or garage. In short every detail has been considered to make these simply the best hose carts available.